This is the classic story of woman meets man, woman wants to travel around Africa, man gets a car and takes over driving, man contracts malaria and woman takes care of him, woman suffers in silence while man is stubborn and refuses to compromise, woman gets fed up and ditches man, woman finds female friends and finally travels around Africa the way she wants. The end. OK, it might not be a classic story, but it should be. American writer Ann Jones was inspired to visit the Lovedu (pronounced low-BAY-doo) tribe in South Africa because they are ruled by a queen who is known for her peacefulness and her reputed power to control the rain. Jones' first traveling companion is a brash, headstrong and obstinate photographer from England named Kevin Muggleton, who is good at fixing their vehicle but is terrible at being kind. Muggleton wants to make a "Cape to Cairo" kind of trip, meaning driving the length and breadth of the continent. Jones wants to see as much of Africa as she can, and is especially interested in the lives of African women. "It's the hard-times Africa you read about: one vast undifferentiated lump of dismal news reports dispatched from dreary expat bars by disaffected Western journalists whose secret woe is that the AIDS epidemic makes it too risky to get laid. I wanted to see the rest of Africa, whatever that might be ... I wanted to meet the common people, who, I imagined, must be very different from the governments that sell them out. I wanted to see the bits and pieces of the continent, so many, so varied, and so complex that they might include a rainmaking queen. Ours would be no great expedition of discovery. But it wouldn't be a Hertz rent-a-weekend either." The pair start their journey in Morocco, drive down the western coastline, through the Sahara Desert, across central Africa and finally split up in Kenya. As Muggleton predicted, every day they faced challenges. In addition to dodgy political conditions, they were up against extremes of nature: desert, jungle, river valleys, mountains, rain and scorching heat. During their months-long trip together, Muggleton would drive as fast as he could, racing through villages and countries and ignoring every request from Jones to stop. The only time Muggleton slowed down was when the vehicle needed repairs. "It dawned on me as I saw in the rearview mirror yet another beautiful watermelon vendor swallowed in the dust behind us that our expedition was split down the middle as surely as if the Senegal River ran straight through the center of the Land Rover, separating Mugggleton from Jones just as it separated north from south... For me the journey had ceased to be a foolhardy adventure and become a sort of quest — not merely for Loveduland, but for Africa. I yearned for the slow pace of African village life, not the forced march of the European barging through the land with conquest in mind. Of course, I wanted to reach Loveduland and see the Queen. Being an aging female, how could I help but be drawn to a community that values aging females, submits to the power of an aging female ruler, recognizes her experience and wisdom, and choose to be guided by her? What could be more natural? But more than that, I wanted to learn from the Africa we were passing through. Today. Now. That would have meant wandering in the streets, lingering in the markets, falling into conversations, and for that Muggleton had no time. Being a young man, he hoped to find himself in adventures that could not come fast enough. He was always throwing his heart before him, someplace down the road." In Nairobi, Jones meets two women who agree to go with her to South Africa, and the pace of their travel slows down. They enjoy a holiday at the beach, they camp and cook traditional African dishes, and they finally find their way to meet the Queen, who was even more impressive and serene than Jones imagined. "As women together we were more or less content to accept the world as we found. To Muggleton Africa was a challenge, an obstacle, a battleground, an arena for the performance of exploits that sprang full-blown from his itchy imagination. To us Africa was the home of people we were pleased to meet. We moved through our days more slowly, though we felt our pace was still too fast." Aside from the interesting power dynamic between Jones and Muggleton, what I especially liked about this travelogue were the details and history of each country they passed through. The differences between the nations could be striking. For example, the roads in Zaire could barely qualify as roads, they were really just giant mud pools in which vehicles frequently got stuck and had to be dug out. But as soon as they crossed into Uganda, which was more politically stable and had better infrastructure, there were paved highways again. It is easy for Westerners to lump all of the countries of Africa together, but this book is excellent at reminding us that no, you cannot do that. "The continent is not all of a piece, one entity with no other history than that imposed by its colonizers. It's a great jumble of individual countries, tiny and immense, poor and rich, agrarian and industrialized, home to countless colors, ethnicities, religions, languages, cultures ... Indeed, one of the great discussions among African intellectuals today concerns what it means to be African ... What makes Africa 'dark' is our own ignorance of the place. We don't know its history or much about its present condition either. We've forgotten that it is the homeland of us all." As you can imagine, when Jones returned to America, she had trouble adapting to the wealth and excess of goods here, and even resented always being shut up in air conditioning. She sold her New York apartment and most of her possessions and headed west to the desert, where she enjoyed living with windows wide open. I enjoyed Jones' writing so much that I plan to read her other books. 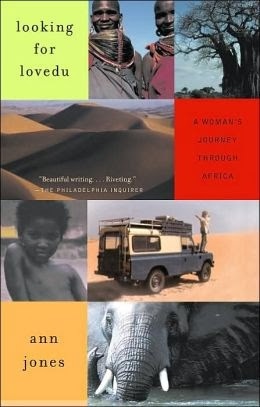 I would recommend "Looking for Lovedu" to anyone who likes travelogues or who wants to read more about Africa.